The most beautiful route in this city is the estuary of the River Tagus, which flows into the Atlantic Ocean to form an inland sea called the Mar Pala. It has one of the most beautiful natural harbors. Thirsty for beauty before the eye of tourists Lisbon spread its palaces, churches and charming old streets of the seven hills which still keep the memory of its golden age. In 1147 Lisbon was conquered by the Crusaders of King Alfons I and became a Christian city. From there began its heyday. Lisbon then owned ships and began trading with Africa and other overseas routes. When in the late 15th century Vasco da Gama opened the way to India, and Pedro Alvarez Cabral founded the colony of Brazil, the capital of Portugal became one of the richest European metropolises, a kingdom in the world power. From this golden age has remained the beautiful Belem Tower, located at the mouth of the River Tagus. Another landmark that deserves to be seen is the Zheronimush monastery built by King Manuel I, in order to thank God for the grace. Lisbon has stood through four earth quakes and a huge fire. On the day of All Saints in 1755, walls fell and the fire killed thirty thousand inhabitants. It destroyed a total of fifteen thousand building, three hundred beautiful palaces and one hundred and ten churches. After the destruction, however, the city was rebuilt. Much of the beauty of Lisbon is due to the modern opinions of the Marquess de pump. The mouth of the Tagus River was built square by practice of Marquess de pump. Its commercial area is a total of 35 thousand square meters. The triumphal arch at the northern edge takes tourists to the so called lower city Baixa, whose stop is located symmetrically. 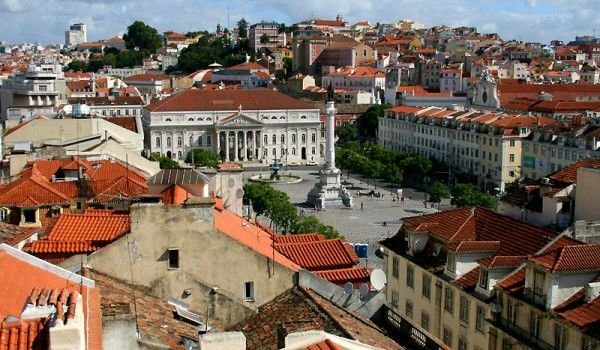 Next to Baixa is Rossio Square, which today is the most bustling place in Lisbon. During 1820 its last heretic was burned. Afternoon coffee is the most delicious in any of the cafes in the beautiful avenue Avenida Libertad too. Other interesting places are the Sao Jorge castle and museum. An interesting walk to one of the elevators which is made of wrought iron and connects the upper and lower town is something to see. Fans of the delicious espresso and the old place, should make no mistake to enjoy a drink in the Cafe awakening Martin de Arcadia. The most delicious lobster can be tasted in restaurant, Ribaduro, where you can enjoy the background Fado songs of love and death. In Lisbon there are hotels of all categories. The best time to visit the town is from mid March to early June or September to early November. Tourists usually are expected to tip 5-10 percent of the bill and other services. Exclusively for guests of the city is the half day trip to Estoril and Cascais and day trips to Sintra and Coimbra Ibidos. Local cuisine stands out for meals of fish which can be cooked in 365 different ways.